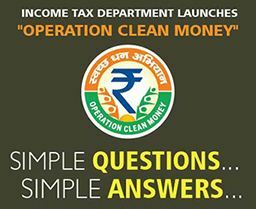 Online verification of Cash Deposits is started on Income tax e-filing portal. If you have deposited high-value cash in your account, time has come to verify your transaction. The information in regards of cash deposit has been made available on Income tax e-filing portal. Additionally, E-mail and SMS is sent by Income tax department for submitting an online response for cash transaction done during demonetization. Let’s take a look at the process to be followed for online verification of “Cash Deposit” on Income tax site. This operation is also called as Operation Clean Money. Step-2 – Click on “Cash Transactions 2016” link under “Compliance” section. Step – 3- If your case is selected for scrutiny, the details of transactions related to cash deposits during 9th Nov to 30th Dec 2016 will be displayed. You have two options (1) The account relates to this PAN (2) The account does not relate to this PAN. If you select the response option “The account relates to this PAN” the screen for capturing details will be displayed. If information referred does not belongs to your PAN you need to select option “The Account does not relate to this PAN” then message “Your feedback will be sent to the information source for confirmation.” will be displayed. On clicking the submit button, the success message along with Transaction ID is displayed on the Screen. Source of Cash Deposit which could be Cash out of earlier Income or Saving. You can also opt the Cash Deposits are exempted from tax. Cash Withdrawn out of bank account. Cash received from identifiable persons with PAN. Cash received from identifiable persons without PAN. Cash received from unidentified person. You also have option to disclose cash under PMGKY scheme. Once you are done with completion of form filing exercise click on submit button. Success Message containing Transaction ID will be displayed. You can view your submitted response and status under “Cash Transaction 2016” Tab. You need to respond within 10 days of getting this message from the IT department. Even if you did not deposit much money in your account, do check your e-filing account. « How to get Free CIBIL Credit Score Report? What to do if the Cash is from the Receipts of Current Year 2016-17???? Which option is to be selected??? This Cash Tansction shows details during Demonitization Phase Only.For current Cash Tansction pay advance Tax and regularize.